Take a tasty trip to the Louisiana bayous with this long-time Cajun favorite! 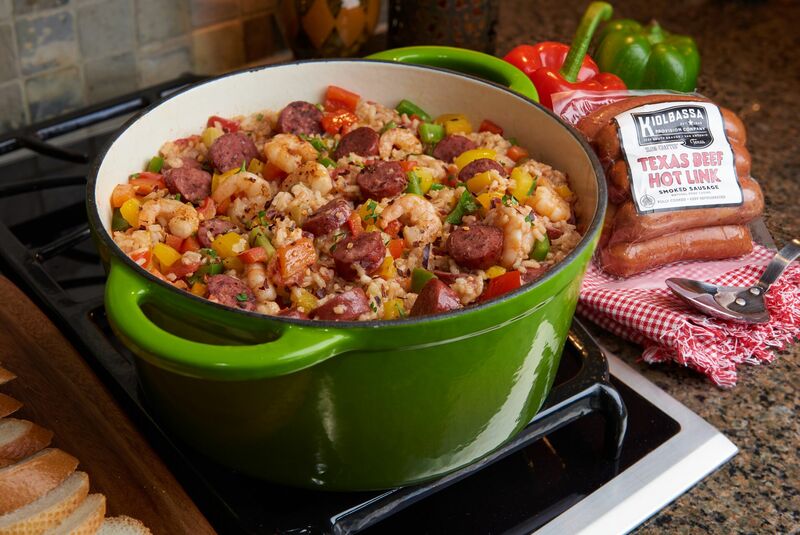 Our Kiolbassa Sausage gives this Jambalaya a rich, meaty flavor that’s sure to please. Heat olive oil in a large pot over medium-high heat. Add celery, onion, bell peppers, jalapeno and garlic. Sauté for about 5 minutes, stirring occasionally, until the vegetables are soft and mostly cooked. Add chicken and sausage, stir to combine. Continue sautéing for an additional 5 minutes, or until the chicken is no longer pink. Add the chicken stock, tomatoes, rice, Cajun seasoning, bay leaf, thyme, cayenne, and stir to combine. Reduce heat to medium-low, cover and simmer for about 25-30 minutes, or until the rice is cooked, stirring occasionally. Once the rice is tender, add in the shrimp and stir to combine. Let the mixture continue to simmer, stirring occasionally, until the shrimp are cooked and pink. Remove bay leaf and season the jambalaya with salt and pepper and hot sauce and additional Cajun seasoning if needed. Remove from heat. Serve warm with optional garnishes if desire.